If you like coffee, then you probably love espresso. If you are anything like me, then you probably don’t start your day without your favorite cup of caffeinated drink. You either grab it at your favorite coffee shop or brew it at home. Either way, if you chose to read this guide, you probably look for an improvement of your current situation. 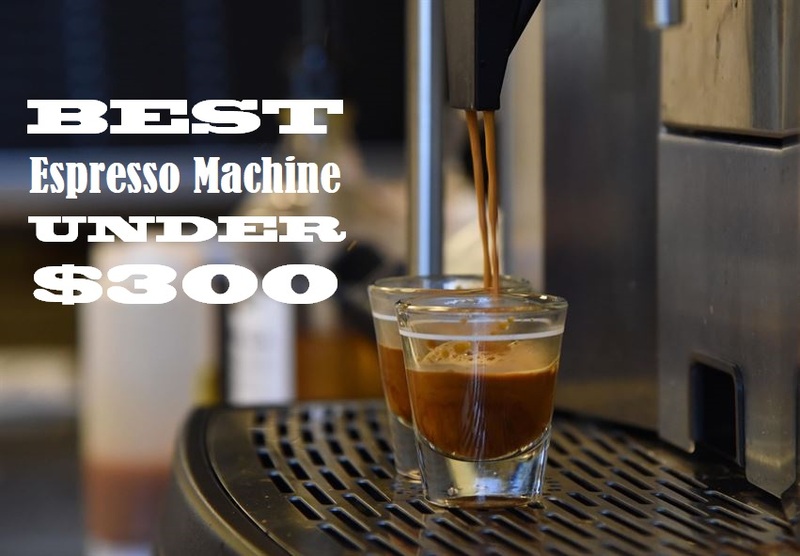 In this guide we’re going to present you the best espresso machine under 300 dollars, and some of the contenders. Doing the proper research, in order to determine which one is the best espresso machine under 300 dollars takes some time. And I’m pretty sure, like most people I know, you never really seem to have enough of it. This is why we decided to invest the necessary time, so you don’t have to. There are many things that can be said about the Breville ESP8XL Cafe Roma Stainless Espresso maker. But one thing is sure, it’s surely one of the options to be considered when it comes to the best espresso machine under 300 dollars. Breville has made a name in the industry by producing high quality, feature rich machines at a fair price. When compared to other competing models in the same price range, the Breville ESP8XL comes with a number of helpful features and accessories that set it apart. These are for example: a tamping tool, a measuring spoon, a milk jug and the possibility of brewing two espresso cups at the same time. 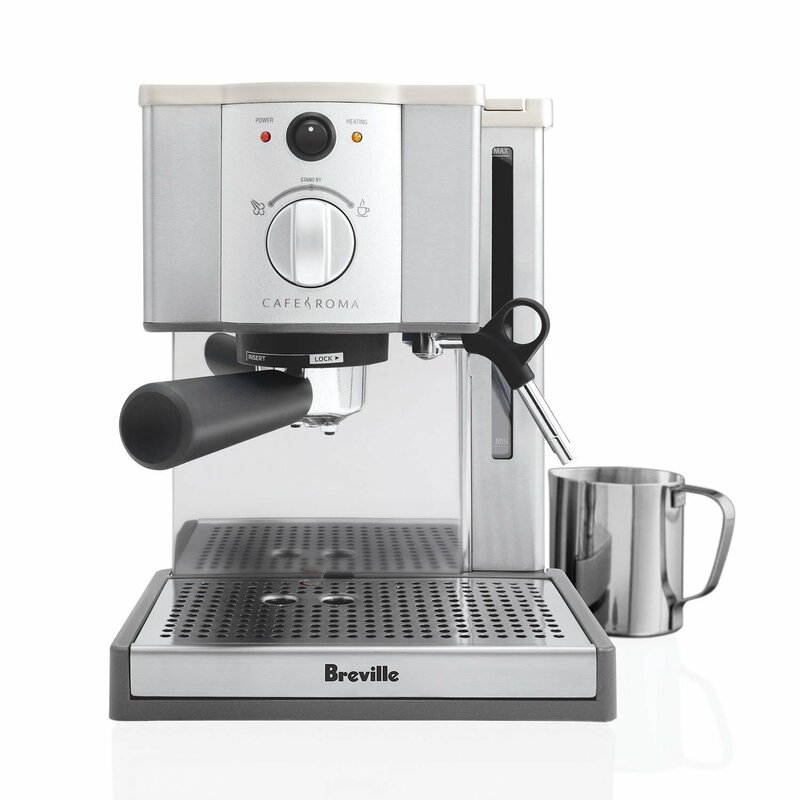 The Breville ESP8XL Espresso Machine has many stainless steel components even on the inside, which makes it highly durable. The thermoblock heating system together with the 15 bar pressure ensures the perfect espresso flavor and heat every time. Also, the cup warming plate on the top can fit up to 6 cups, which means you can serve your friends perfect espresso in no time. 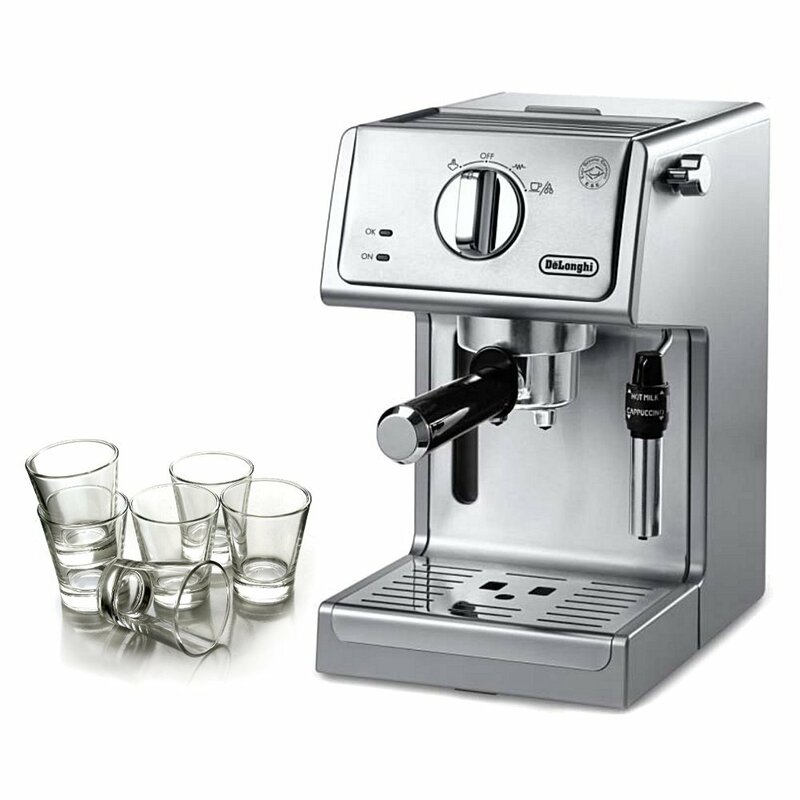 If you ask us, your money is well spent with this espresso machine considering that most reviewers said that they had it for years without encountering any major problems. Included tamping tool and measuring spoon. Doesn’t include a built-in grinder. If you’re anything like me, then you highly appreciate counter space in your kitchen. For all of us with this way of seeing things, DeLonghi has produced probably one of the most compact espresso machines on the market. It will only take up approximately 6 inches of counter space, in width. And of course, keeping all the high standards you would expect from a high end espresso machine. It has many stainless steel parts, just like the Breville presented before. This means that those parts are likely to last quite a while longer than you would expect with other espresso machines. The great advantage of reduced space comes with a weakness. They tried to save space wherever they could. So, you will not be able to fit a normal sized coffee mug underneath. You will probably have to go for actual espresso cups, which are considerably smaller than your average coffee mug. But if you already decided on getting an espresso machine, then you might a well get some authentic espresso cups for the experience to be complete. Although you will nor be able to use coffee beans directly because it lacks a built-in grinder, you can use pods besides normal ground coffee. Another advantage is the milk frother which is a nice feature if you want to have a cappuccino from time to time. The machine will be ready to brew as fast as 30 seconds because of the thermoblock system, which is one of the most reduced waiting periods across the category. You can brew 2 espresso cups at the same time. The reason why we include a second De’Longhi among our recommendations for the best espresso machine under 300 Dolllars is not a matter of luck. The name has quite a history in the production of fine Italian espresso machines, regardless of the price range. 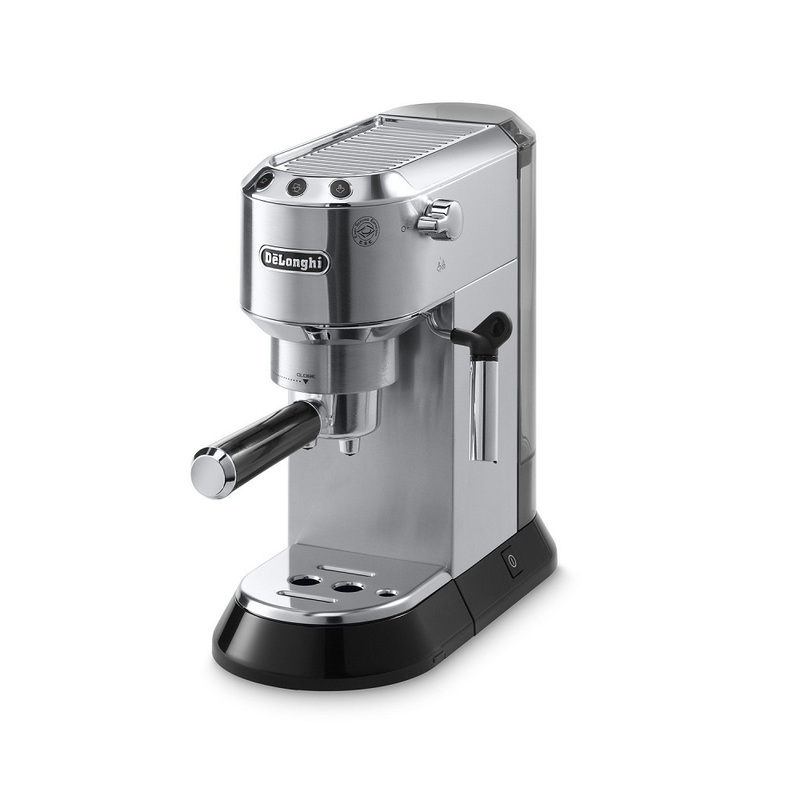 While other machines from De’Longhi might lack one feature or another, this model looks like it has everything you need in an espresso machine. A big advantage of this particular model is the fact that you can adjust it for different cup sizes. Although espresso is meant to be a reduced volume drink, there’s plenty space to put a larger mug underneath. You can also choose between a single or double shot. Another annoying aspect with other espresso machines is the heat up time. With this one you will not have this problem as you can brew your favorite morning drink in matter of moments after turning it on. You can also use pods in case you don’t like using ground coffee. Regardless of the style of your kitchen, the DeLonghi ECP3630 will fit in nicely as it has a sleek and compact design. Have you ever experienced wanting to brew a shot of espresso and not being able to because of lack of sufficient water in the tank? Annoying, isn’t it? You will not have to go through that with this espresso machine because it has a water level indicator that will let you know when you have to replenish. If you not only want to brew a barista-level espresso in your home, but also feel like a barista while doing it, the Capresso 118.05 EC PRO Espresso Machine should be one of the choices on your short list. You can brew a single or double shot because it includes two different filter basket options. Many espresso machines have a problem that Capresso seems to have found the solution for. The water reservoir maintains heat at an optimum temperature so that you can brew your favorite espresso drink whenever you want to. Thanks to the double brewing nozzle the Capresso 118.05 was fitted with, you can either brew one double espresso or 2 single shots at the same time. This is a helpful feature if you have a guest over and want to enjoy a nice espresso simultaneously. An interesting feature, that takes some time to get accustomed to though, is the bottomless filter. It offers more control because it builds up pressure according to grind size and tamp. This also implies, like mentioned before, kind of a learning curve. But as with riding a bike, once you get the hang of it, nothing will seem easier than obtaining an even richer and more flavorful espresso. This type of filter is superior to the double spout espresso filter. It might not seem so at the beginning, but down the road it’s what you want. This is similar to a car being superior to a bicycle; both very good ways to cover distance. The steel swiveling frothing wand is a great addition to have in case you like to fix yourself cappuccinos and lattes. You can use it to both steam and froth. It also doubles as a hot water dispenser. All these features that the Capresso 118.05 has, that can be found in much more expensive machines, but in this case, at an entry level price, make this product a great contender for the best espresso machine under 300 Dollars range. 15 bar pump provides optimum crema. While conducting our research and trying to determine which products to include in our best espresso machine under 300 Dollars guide, we found we couldn’t leave the Mr. Coffee BVMC-ECMP1000 out. There are a number of straight forward reasons for this. First and foremost, there aren’t many other espresso machines on the market that can make brewing espresso this easy. This machine’s one touch control panel lets you brew your favorite drink in less time than you would expect. The control panel is very easy to read and use. You just have to choose single or double shot espresso, cappuccino or latte and off you go. 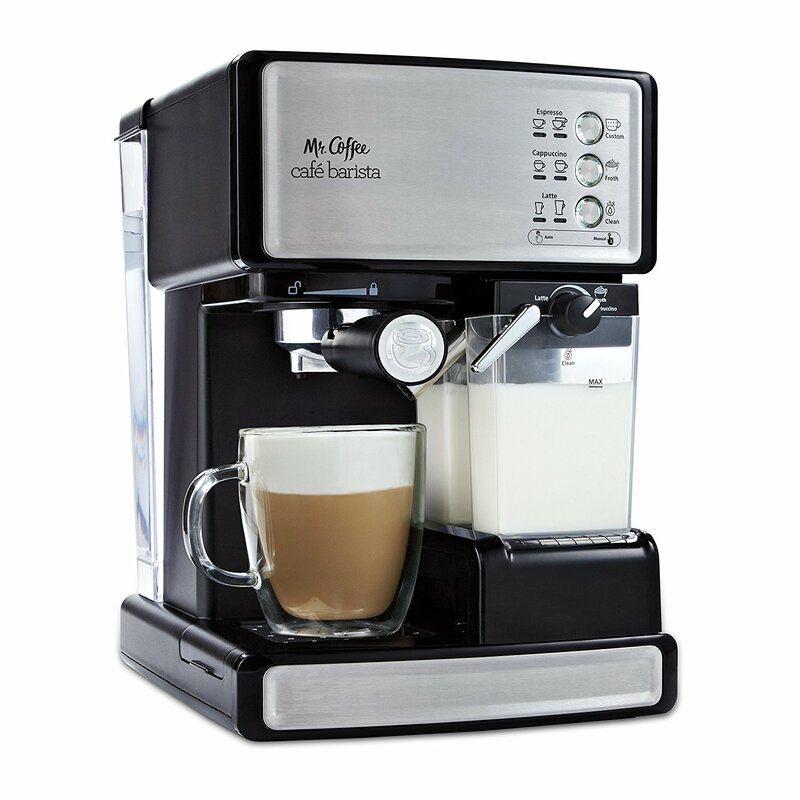 The automatic milk frother will take care of preparing the milk just right for a creamy cappuccino or latte. The included jug is a great addition. You can easily remove it when necessary, to clean and refill. The water reservoir is also removable. Another helpful feature is the adjustable cup tray that lets you set the right height for a small espresso cup or a bigger mug. The drip catcher is also removable so you can easily wash it. When trying to identify a best product like the best espresso machine under 300 Dollars, there are a number of aspects that you need to take into account. Without having a clear system laid out after which you classify the plethora of products available on the market, you might feel overwhelmed and not know where to start. Just take a moment, lean back and think about the enchantment of that perfect espresso. Close your eyes and imagine the attractive smell, the rich texture and the variations in taste. All this can be at the tip of your fingers. You just have to make the right choice. But there exists the possibility of not making the right choice, which could turn that nice dream into a horrible nightmare. And with the multitude of options there are on the market nowadays, making the wrong choice is a lot easier than making the right one. This is why we stress the idea of having guidelines when you do your research as such an important fact. Of course, you could go with one of the options that we determined as being a very good choice for the best espresso machine under 300 Dollars, or you could do the research yourself if you don’t lack the necessary time. To help you put the right guidelines in place, you will have to take the following aspects into account. There are 4 types of espresso machines: manual, semi-automatic, automatic and super-automatic. From a technological point of view, the “more” automatic your espresso machine is, the less skills you need in producing that perfect espresso. Some coffee drinkers prefer to do most of the preparing process by hand, from a desire to have further reaching control over the end result. If you find yourself in this category, manual is the way to go. But you have to be sure that you’re a true connoisseur. Anything below this, and you would probably want something higher on the automation scale. 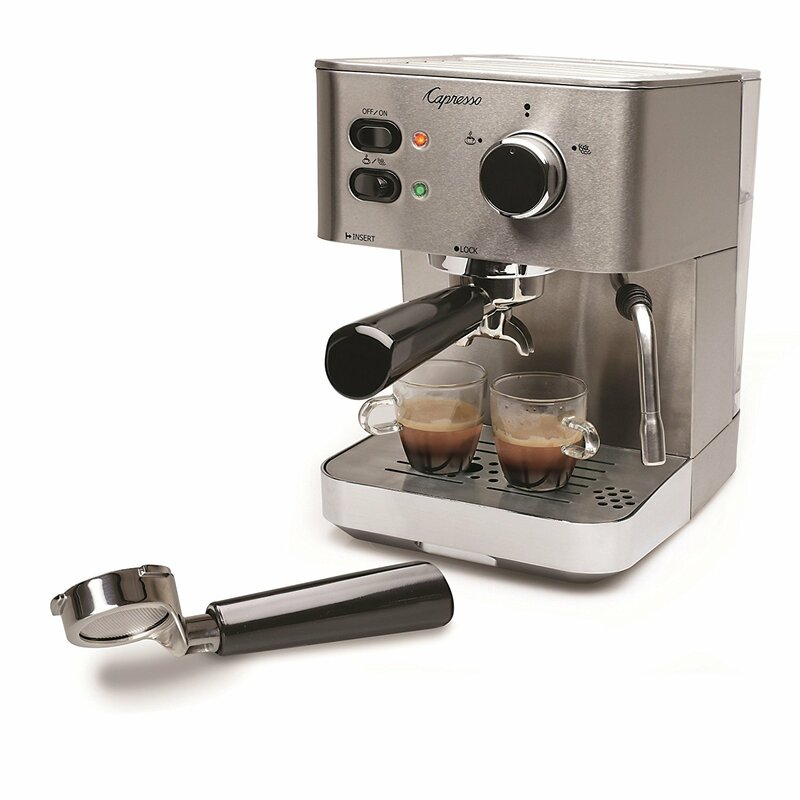 One of the most recent features of the latest models of espresso machines is the built-in grinder. It’s not necessary, but it’s a feature that makes somewhat of a difference. It enables you to store roasted coffee beans in the container so that when you decide to have an espresso, the machine will grind the right amount in that very moment. This gives your coffee a superior aroma, but also an unparalleled freshness. Again, it’s not something you can’t live without, but it’s definitely a nice feature to have in the best espresso machine under 300 Dollars. Water storage options differ from one espresso machine to another. First, there are two major differences between different models. Some have a water tank that you have to pour water into, and some need to be connected directly to the water source. Among those that have water containers, some have larger containers, and some, especially the compact ones have smaller containers. There are some models that have a water container that can only fit enough for around 6 espresso shots. The capacity of the container doesn’t speak about the quality of the machine, but about the user convenience. If you don’t want to be refilling often, then you will have to choose accordingly. If you like to drink specialty coffee drinks like cappuccinos, americanos, lattes or moccas, the frother is definitely an important feature of the best espresso machine under 300 Dollars for you. Getting these drinks right, without the right frother is next to impossible. What you want to look for is an espresso machine with a frother that can process the milk at the right temperature and pressure. There is no coffee or espresso machine out there that doesn’t have certain maintenance and cleaning needs. You have to clean your espresso machine regularly in order to maintain a high level of quality in your drinks. If you fail to clean it properly, your espresso’s quality will slowly but surely go on a downward path. Some espresso machines have certain automatic cleaning programs, others don’t. So, this is definitely a factor you must be considering. Usually vinegar will do the trick with most machines, but it doesn’t hurt getting all the facts before making a decision. Taking durability into account, especially when you have a larger budget is something very important. You don’t want to spend big bucks on a machine and then have to take it into service very often. Usually other buyers will not refrain from telling if they experienced any inconveniences with their machine, durability wise. Even the best espresso machine under 300 Dollars should be quite durable, despite the limited budget, it should have parts that need to last for a few years at least. It’s a good rule of thumb to spend your hard earned money only if you are sure that it’s going to last for a while. Last but not least, there’s value for money. This factor is more of an aggregate of multiple factors. You should always try to get the most for your budget.